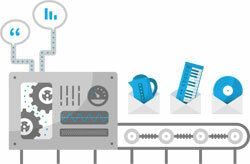 What’s next in email marketing? What technology does a modern marketer need in the Amazon dominated world of e-commerce? The rules of the game are changing rapidly in e-commerce. The technologies facilitating these changes are disproportionately found in the application layer. The innovations we have been seeing in email marketing all come from a shift in focus from quantity to quality. Foundational principles like email deliverability have been largely figured out – the inefficiencies in email marketing lie less in deliverability than in the quality of messages and their accompanying click throughs and conversion. The next wave of e-commerce technologies is helping marketers increase the quality of their emails through innovations such as A/B testing, prioritization, and triggering. The providers of these services are of a different breed: they are application layer companies and have focussed their efforts on these specific functions. Application layer companies partner with email service providers (ESPs) to make emails more effective, instead of competing with them. In other words, the application layer plugs into your ESP and provides a very specific marketing function or technology (such as A/B testing). These companies are emerging because many of the services in this new wave of e-commerce require a high degree of specialization. A/B Testing: A/B testing helps marketers optimize the content of their messages. A/B testing accomplishes this by comparing the effectiveness of emails with small differences in email headers, copy, and branding. Prioritization: It’s not about sending more emails, it’s about sending better emails. Prioritization services allow companies to ensure that they only send the most relevant marketing message to a customer, without sending too many. Triggering: Triggering involves setting up on-site triggers that automatically deploy marketing messages based on a specific customer’s activity. Personalization: Personalization involves creating email messages and content tailored to an individual customer based on user-specific data. Analytics & Reporting: In today’s world of Big Data, having easy access to data has never been more important. Analytics and reporting companies are making rich and deep data accessible to marketers. Not only does application layer technology make the above features more sophisticated, but they also make them much easier to use. A lot of the innovation in these technologies has been not just in the capability, which powerhouses like Amazon have already figured out, but also in the accessibility. In other words, a lot of the innovation has been in making these products inexpensive and usable for small to medium sized e-retailers. For example, A/B testing on your website is not a new concept, but by making it turnkey to implement, companies such as Optimizely are allowing smaller e-commerce sites to finally start using A/B testing. What this overall trend means is that marketers will have to not only to choose a type of ESP, (which is already hard enough), but also choose from a suite of non-mutually exclusive application layer companies. Although in some ways this makes the emerging email vendor ecosystem more difficult for e-retailers to navigate, because there are more decisions to make, it simultaneously makes the testing process much easier. It is a big overhaul to switch an ESP, but to simply plug in or unplug an application layer company from your ESP is much easier. This makes the risk of testing different e-commerce specific application layer technologies much lower. The marketers who properly take advantage of the symbiotic relationship between these emerging application layer vendors and their ESPs will reap large returns in retention, engagement, and revenue. It will be these marketers that propel their e-commerce companies forward. Max is the resident business generalist at TriggerMail (www.triggermail.io). In a past life, he was a co-founder of a musical networking startup and a trader at Goldman Sachs. Max is a proud graduate of Washington University in St. Louis.